Introduction: Blood transfusions have been reported to cause post-operative complications. Despite the protocols being conducted to minimize the utilization of blood transfusion and improve the standard of care in blood transfusion strategy, there is no consensus on transfusion indication threshold. Objectives: This study assessed the effect and complication using a new restrictive blood transfusion strategy threshold in patients undergoing total knee replacement. Materials and methods: This study performed observational evaluation on the proportion of patients to be transfused with the new restrictive blood transfusion strategy (Hb level below 8 g/dL and/or presence of symptoms of anemia) and compared post-operative symptoms of transfused patients to un-transfused patients, who underwent total knee surgery at Police General Hospital. A total of 120 patients were studied. Patients’ demographics, peri-operative parameter, and post-operative symptoms in conjunction with length of hospitalization were compared between groups. Statistics was determined for each parameter and analyzed using Student’s t-test, Pearson’s chi-square test, Fisher’s exact test, and odd ratio at 95% confidence level. Results: Of 120 patients, 12 patients (10%) were transfused. The post-operative complications including cardiovascular, respiratory, gastrointestinal, infection, and other symptoms did not differ significantly between transfused and un-transfused patients (p>0.05), except that there was more neuropsychiatric symptom in the un-transfused group than the transfused group (in 16.3% vs. 1.6% of patients; 95% CI 1.43-101.97), whereas the length of hospital stay was not different between groups (p>0.05). Blood utilization reduction with the new transfusion strategy was 74 units. Conclusion: Among patients undergoing total knee replacement, most patients with hemoglobin level 8-10 g/dL were tolerant to the new transfusion strategy (90.24%). Further, post-operative symptoms were not significantly higher between transfused and un-transfused patients. Also, as in the aforementioned study, the new transfusion strategy is considered relatively safe and can be effective as a blood conservative algorithm. Arthroplasty of the knee replacement is considered to be the most commonly surgical reconstructive procedure performed in the United States of America . Upon data collection, there are more than 350,000 total knee replacements (TKR) in 2007, and may be increasing to 500,000 operations in 2020 . The loss of blood during this operation can be remarkable, with the capacity usually varying from 300 to 1000 ml . One study reported the significant quantity of blood loss that varied from 1450-1790 ml . It was reported by Lotke et al. that the average loss of blood in total knee replacement calculated from the perioperative drop in hemoglobin (Hb) was 1518 ml and mean hematocrit (Hct) drop was 5% [1,3,4]. The anemia from peri-operative blood loss was highlighted to be the cause of post-operative infection, slow physical recovery, lengthening of hospitalization, as well as increase in morbidity and mortality. In order to reduce blood loss during total knee replacement, several blood management strategies have been introduced, as demonstrated in Figure 1. Firstly, pre-operative blood management strategies have the intention of achieving optimal level of hemoglobin so that the patients can withstand physiologic change related to the loss of blood from the surgical operation . Several procedures belonging to this strategy include the consumption of iron for 256 mg/day, vitamin C for 1,000 mg/ day, folic acid supplementation for 5 mg/day, pre-operative autologous blood donation (PAD), epoetin alfa administration . Secondly, intra-operative policies intend to reduce the significant loss of blood during surgical procedure as well as immediately after the operation . This strategy can be achieved through the application of tourniquet [1,5], tranexamic acid (TA) [5-7], peri-articular analgesic injection containing epinephrine , topical hemostatic agents (for example, platelet-rich plasma  and fibrin sealants [1,5]), argon-beam coagulation (ABC) , bipolar sealants electrocautery devices , and acute normovolemic hemodilution (ANH) . Thirdly, post-operative management, such as blood transfusion, intra-articular suction drain , reperfusion system , compression , cryotherapy , cell salvage , and iron supplementation [10,11]. Figure 1: Schematic diagram of blood transfusion management for TKR. Several studies have reported the disadvantages of allogeneic blood transfusion to include infection  (especially human immunodeficiency virus, hepatitis B virus, hepatitis C virus, and T-cell lymphocytic virus ), allergic reaction, and immunologic reaction [1,13] (such as immune-mediated transfusion effects , post-transfusion febrile reaction , immune-mediated hemolytic anemia ), antibody reaction (the allogeneic blood transfusion seem to aggravate the immune alteration toward a T-helper 2 (Th2) type of response, and likely furnish to down-regulation of cellular immunity ), volume overload [5,15], hyperkalemia , longer length of hospital stay , and increased mortality rate [9,17], as recorded in Table 1. Table I: Postoperative complication in transfused patients underwent primary total hip arthroplasty and primary total knee arthroplasty significantly increased compared to not transfused patients [9,17]. However, inappropriate blood transfusion has been widely practiced. Approximately thirteen-million units of allogeneic packed red blood cells (PRBCs) transfusion were performed annually in the US, with patients undergoing surgery comprising the majority of recipients . Many discarded units  and mis-allocations highlight the need to standardize RBC transfusion practice following total joint replacement, which affected cost of treatment, as shown in Table 2 . Restrictive transfusion strategies are an effective method of reducing and conserving the red blood cell (RBC). The ultimate goal of this study was to reduce the blood transfusion to reduce the cost and unnecessary use of natural resources, to avoid the complication from blood transfusion, and to establish further studies about predictor of blood transfusion. The study was intended to assess the effect as well as complications after using a new restrictive blood transfusion strategy based on Hb level below 8g/dL compared to liberal blood transfusion strategy based on Hb level below 10 g/dL for Thai patients. Table II: Illustrate that blood transfusion significantly affect the cost of treatment in TKR . This study evaluated whether a new transfusion strategy was applicable to Thai patients. The new restrictive blood transfusion strategy was to administer blood transfusion if the patient has post-operative Hb<8 g/dL or post-operative Hb 8-10 g/dL with prodromal symptoms of anemia, as shown in Figure 2. The prodromal symptoms are defined as followings: dizziness, syncope, headache, tachypnea, dyspnea, cardiac chest pain, congestive heart failure, tachycardia (>80/min), or hypotension (<90/60 mmHg) unresponsive to fluid challenges. We conducted the observational study at Police General Hospital, Thailand. A total of 120 patients underwent primary total knee replacement between November 2016 and December 2017. The study was submitted and approved by the Ethics Committee in Human Research (Certification of Approval Reference No: 91/2016). The patients undergoing total knee surgery were provided the inform consents. The demographic data and peri-operative variables were collected, including age, gender, weight, height, race, resident involvement, underlying disease, type of total knee surgery, type of anesthesia, ASA score, and blood loss. The presence of prodromal symptoms was also monitored. Figure 2: Blood transfusion strategy management for TKR. The categorical variables were delineated by means of percentage and relative frequency distribution in conjunction with Pearson’s chisquare test and Fisher exact test, while the quantitative variables were reported by mean and standard deviation along with Student’s t-test. To assess the possible intervening variables, the odd ratio (OR) was performed by the bivariate correlation of type of complication to each strategy of blood transfusion. The data were statistically analyzed using Statistical Package for the Social Sciences software version 19 (SPSS Inc., Chicago, IL, USA). In this prospective study, 120 patients were observed, 21.67% (n=27) were men and 78.33% (n=94) were women. The patients’ profiles, that include their age, gender, weight, height, race, resident involvement, underlying disease, type of total knee surgery, type of anesthesia, ASA score, blood loss, and other baseline characteristics, were described in Table 3. Regarding types of surgery, 26.67% (n=32) patients underwent total knee replacement on the left side, 32.5% (n=37) on the right side, and 40.9% (n=51) on both sides. The mean ± SD for blood lost was 27.81 ± 43.62 ml. In Table 3, the patient’s perioperative data is described. Table III: Patient’s baseline characteristics and perioperative variables. The proportion of patients to be transfused with the new blood transfusion strategy was indicated in Figure 2. Post-operative hemoglobin as demonstrated in Table 4. There were 8 patients who had Hb10 g/dL. Blood utilization reduction with the new strategy was 74 units. Table IV: Post-operative symptoms and perioperative variables. There were no significant differences in overall post-operative symptoms regarding transfusion (p>0.05). There were no significant differences in cardiovascular symptoms, respiratory symptoms, gastrointestinal symptoms, infection, and other symptoms regarding transfusion (p>0.05). However, significant difference was observed in neuropsychiatric symptoms due to the effect of anemia (p<0.05). Their length of hospital stay was also not different in terms of blood transfusion (p>0.05). The post-operative symptoms regarding blood transfusion strategy were analyzed, as shown in Table 5. The overall postoperative symptoms (OR: 1.147; CI 95%: 0.521-2.525), cardiovascular symptoms (OR: 1.100; CI 95%: 0.448-2.699), respiratory symptoms (OR: 0.726; CI 95%: 0.064-8.269), gastrointestinal symptoms (OR: 1.418; CI 95%: 0.604-3.330), neuropsychiatric symptoms (OR: 12.056; CI 95%: 1.425-101.971), and other symptoms (OR: 1.190; CI 95%: 0.301-4.710) are revealed in Table 5. No infection complication was found in this study. Table V: Analysis of post-operative complications and perioperative variables. Several strategies relating to the management of blood for patients who underwent surgical procedure of total knee replacement are available [1,3,9]. Post-operative blood transfusion is the widely used strategy. In spite of the risk of blood transfusion, high-level literature that can be used as a guideline for transfusion in this patient group is limited. In order to address this issue, previous researchers have studied the transfusion indication threshold reduction (TITR) to decrease the blood transfusion rate. Generally, it is widely adopted as a standard of clinical practice in blood transfusion for the patients as a “10/30 rule” (in case of Hb drops below 10 g/dL and/or the Hct level drops below 30% [7,15], the transfusion is administered). However, the postoperative Hb threshold at which the post-operative red-cell transfusion is warranted is still controversial [16,19,20]. Hence, multiple studies were established as follows. First, a randomized controlled trial (RCT) comparing the liberal group and the restrictive group using different cut-point upon each study  was conducted; most of the studies demonstrated that transfusion when the Hb was high did not decrease the morbidity and mortality compared to transfusion when the Hb was low . In the study of Carson JL et al. in 2011 and 2015, a liberal strategy of blood transfusion (a hemoglobin threshold of 10 g/dL), in comparison with the restrictive strategy of blood transfusion (indicated as symptoms of anemia or presence of hemoglobin level of <8 g/dL) revealed no reduction in the mortality rates [19,20]. In the study of So-Osman et al. in 2013, the patients were categorized into 3 groups depending on age (less than 50 years old, 50-70 years old, more than 70 years old) . The result of that study shows that each group has its own appropriate Hb threshold for transfusion and there is no difference in outcome between the restrictive group and the liberal group . None of the aforementioned studies [19-21] show benefit of transfusion in patients who underwent TKR while having Hb level >8 g/dL. Second, the predictor for transfusion was studied [12,16,17,22]. In the study of Millett PJ et al. 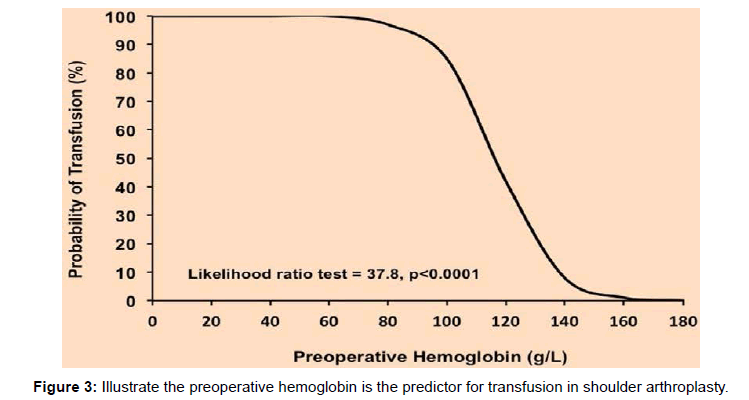 in 2006, the preoperative Hb level was the strongest predictor for blood transfusion after shoulder replacement, as shown in Figure 3 . The study shows that the baseline Hb level was the predictor for blood transfusion, and the transfusion trigger was 8.93 ± 1.83 g/dL. Third, symptoms of anemia have been considered as an indicator for transfusion [23,24], such as hypotension or tachycardia unresponsive to fluid challenges [15,20,25], cardiac chest pain [15,20,25,26], congestive heart failure [20,25], other clinical manifestations (nausea , dizziness [21,26], lightheadedness, tachycardia (>100) , general malaise , pallor , tachypnea, dyspnea, fatique , headache, visual impairment, syncope, approximated or expected loss of blood >15% of total volume of blood, diastolic blood pressure <60 mmHg, dropping of systolic blood pressure >30 mmHg from baseline, oliguria or anuria, alteration of consciousness , evidence of myocardial ischemia including angina, shortness of breath  or dizziness with exertion, weakness , and muscle cramps ). According to the study conducted by Murphy et al., if the patient shows the clinical manifestations mentioned above, it was recommended that 1 unit of blood component be administered . Figure 3: Illustrate the preoperative hemoglobin is the predictor for transfusion in shoulder arthroplasty. c. In patients with Hb 6-8, consider ongoing losses, patient factor, cardiovascular risk, symptomatic due to anemia. In order to evaluate the proportion of patients to be transfused with the new transfusion strategy, we conducted observational study comparing transfusion strategies in 120 patients. The proportion of transfused patients was 100% (8 patients) for patients with hemoglobin level <8 g/dL, and for patients with hemoglobin level between 8-10 were 9.76% (4 patients). If the classical strategy (transfusion threshold=10 g/dL) had been used in our study, 40.8% (49 patients) would be transfused. On the contrary, the new restrictive strategy was used in our study and only 10% (12 patients) were administered blood transfusion. Patients tolerant to this strategy were 90.24% (37 patients), as shown in Figure 4a and 4b. The blood utilization reduction with this new blood transfusion strategy was 74 units. 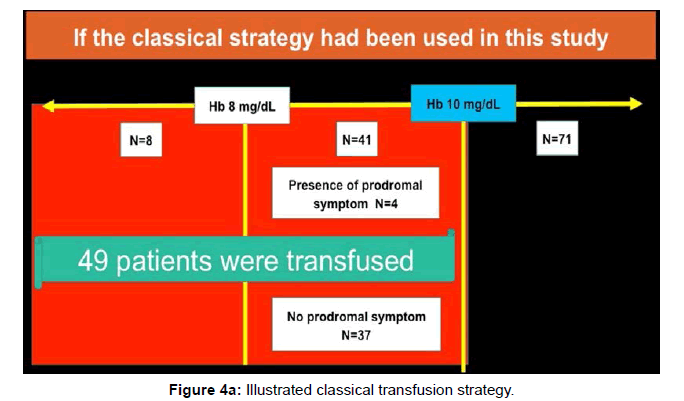 Figure 4a: Illustrated classical transfusion strategy. 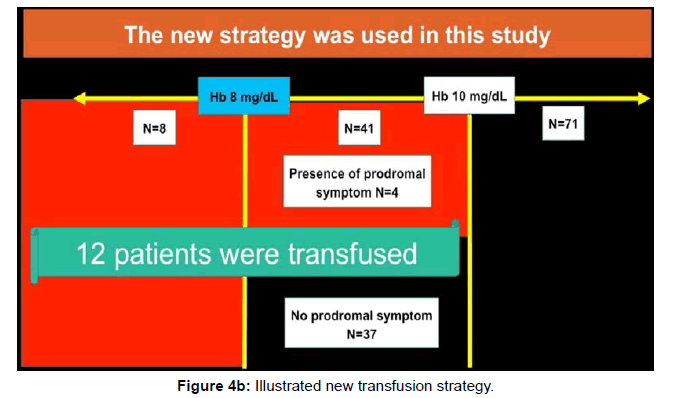 Figure 4b: Illustrated new transfusion strategy. Upon sub-analysis focusing on prodromal symptom for the patients having hemoglobin between 8-10 g/dL, 3 patients with dizziness and 1 patient with headache were observed. Furthermore, upon focusing on prodromal symptom for the patients with hemoglobin <8 g/dL, 1 patient with dizziness was observed. The post-operative symptoms were analyzed. The cardiovascular symptoms for both the un-transfused group (25.6%) and the transfused group (23.8%) were comparable (p=0.835). Also, the respiratory symptoms and the gastrointestinal symptoms in both groups were not significantly different (p>0.05). No infection was observed in either group. The other symptoms seen in both the un-transfused group (9.3%) and the transfused group (7.9%) were comparable (p>0.05). However, a significant difference (p<0.05) in neuropsychiatric symptoms was evidenced between the groups. No significant difference in duration of hospitalization was noted between the groups (p>0.05). This study indicated that most patients with post-operative hemoglobin level 8-10 g/dL were tolerant to the new transfusion strategy (90.24%, 37 patients out of 41). This new blood transfusion strategy is considered to be relatively safe. The impact of this study is crucial to clinical practice since it is the first such study conducted in the South-East Asian region. Also, the strength of this study is that we can assume that our results can be generalized for practicing TKA. Since our institution is a general hospital, most patients undergoing total knee replacements are included for the region. In the future, the study of predictor of blood transfusion and RCT to evaluated effect of transfusion strategy is suggested. This investigation described that most patients possessing a level of hemoglobin at 8-10 g/dL after surgery are capable of adapting to the new transfusion strategy. The new transfusion strategy is considerably safe and can be effective as a blood-conservative algorithm to reduce blood transfusion after total knee replacement. Dizziness and headache are the only prodromal symptoms to be concerned when using this strategy. Levine BR, Haughom B, Strong B, Hellman M, Frank RM (2014) Blood management strategies for total knee arthroplasty. J Am Acad Orthop Surg 22: 361-371. Wong J, Abrishami A, El Beheiry H, Mahomed NN, Roderick Davey J, et al. (2010) Topical application of tranexamic acid reduces postoperative blood loss in total knee arthroplasty: a randomized, controlled trial. J Bone Joint Surg Am 92: 2503-2513. Lotke PA, Faralli VJ, Orenstein EM, Ecker ML (1991) Blood loss after total knee replacement. Effects of tourniquet release and continuous passive motion. J Bone Joint Surg Am 73: 1037-1040. Vochteloo AJ, Boger van der Burg BL, Mertens B, Niggebrugge AH, de Vries MR, et al. (2011) Outcome in hip fracture patients related to anemia at admission and allogeneic blood transfusion: an analysis of 1262 surgically treated patients. BMC Musculoskelet Disord 12: 262. Su E, Su S (2016) Strategies for reducing peri-operative blood loss in total knee arthroplasty. Bone Joint J 98-B: 98-100. Khan N, Troelsen A, Husted H (2015) Prevention of post-operative anaemia in hip and knee arthroplasty-a systematic review. Dan Med J 62: A5170. Phan DL, Ani F, Schwarzkopf R (2015) Cost Analysis of Tranexamic Acid in Anemic Total Joint Arthroplasty Patients. J Arthroplasty 31: 579-582. Carson JL, Terrin ML, Magaziner J, Chaitman BR, Apple FS, et al. (2006) Transfusion trigger trial for functional outcomes in cardiovascular patients undergoing surgical hip fracture repair (FOCUS). Transfusion 46: 2192-2206. Spahn DR (2010) Anemia and Patient Blood Management in Hip and Knee SurgeryA Systematic Review of the Literature. Anesthesiology 113: 482-495. Wallis JP, Wells AW, Whitehead S, Brewster N (2005) Recovery from post‐operative anaemia. Transfus Med 15: 413-418. Millett PJ, Porramatikul M, Chen N, Zurakowski D, Warner JJ (2006) Analysis of transfusion predictors in shoulder arthroplasty. J Bone Joint Surg Am 88: 1223-1230. Murao M, Viana MB (2005) Risk factors for alloimmunization by patients with sickle cell disease. Braz J Med Biol Res 38: 675-682. Kirkley S, Cowles J, Pellegrini VD, Harris CM, Boyd AD, et al. (1998) Blood transfusion and total joint replacement surgery: T helper 2 (TH2) cytokine secretion and clinical outcome. Transfus Med 8: 195-204. Browne JA, Adib F, Brown TE, Novicoff WM (2013) Transfusion rates are increasing following total hip arthroplasty: risk factors and outcomes. J Arthroplasty 28: 34-37. Hart A, Khalil JA, Carli A, Huk O, Zukor D, et al. (2014) Blood transfusion in primary total hip and knee arthroplasty. Incidence, risk factors, and thirty-day complication rates. J Bone Joint Surg Am 96: 1945-1951. Chen AF, Klatt BA, Yazer MH, Waters JH (2013) Blood utilization after primary total joint arthroplasty in a large hospital network. HSS J 9: 123-128. Carson JL, Terrin ML, Noveck H, Sanders DW, Chaitman BR, et al. (2011) Liberal or restrictive transfusion in high-risk patients after hip surgery. N Engl J Med 365: 2453-2462. Carson JL, Sieber F, Cook DR, Hoover DR, Noveck H, et al. (2015) Liberal versus restrictive blood transfusion strategy: 3-year survival and cause of death results from the FOCUS randomised controlled trial. Lancet 385: 1183-1189. So-Osman C, Nelissen R, Brand R, Faber F, Slaa R, et al. (2013) The impact of a restrictive transfusion trigger on post-operative complication rate and well-being following elective orthopaedic surgery: a post-hoc analysis of a randomised study. Blood Transfus 11: 289-295. Rosencher N, Kerkkamp HE, Macheras G, Munuera L, Menichella G, et al. (2003) Orthopedic Surgery Transfusion Hemoglobin European Overview (OSTHEO) study: blood management in elective knee and hip arthroplasty in Europe. Transfusion 43: 459-469. So‐Osman C, Nelissen R, Brand R, Brand A, Stiggelbout AM (2011) Postoperative anemia after joint replacement surgery is not related to quality of life during the first two weeks postoperatively. Transfusion 51: 71-81. Liumbruno G, Bennardello F, Lattanzio A, Piccoli P, Rossetti G (2009) Recommendations for the transfusion of red blood cells. Blood Transfus 7: 49-64. Murphy M, Wallington T, Kelsey P, Boulton F, Bruce M, et al. (2001) Guidelines for the clinical use of red cell transfusions. Br J Haematol 113: 24-31. Sharma S, Sharma P, Tyler LN (2011) Transfusion of blood and blood products: indications and complications. Am Fam Physician 83: 719-724. Copyright: © 2018 Juntavee V, et al. This is an open-access article distributed under the terms of the Creative Commons Attribution License, which permits unrestricted use, distribution, and reproduction in any medium, provided the original author and source are credited.